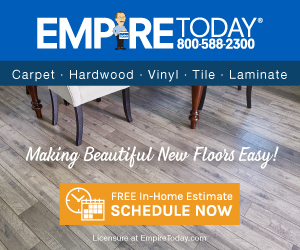 Empire Today - Empire Carpets BAD installation and BAD customer service!! Sep 03, 2010 As the National Customer Service Manager, it is very important that our customers are satisfied with the service and products that they receive. I apologize that they products that you purchased didnâ€™t meet your expectations. We do offer product manufacturer warranties and we stand behind our installation with a one year warranty. I would like the opportunity to discuss your concerns with you and determine a mutually agreed resolution. Please feel free to give me a call at 888-588-2315 x4195 or you can email me at customersupport@empiretoday.com. Rebekah Clerk, National Customer Service Manager. We called Empire CaArpets anxious to see what the have. We also liked the ida of them coming to you , being able to look at all the smaples at home in your own lighting was great! It didn't take long after the carpet was installed to start looking bad, the fibers were already laying down and it just didn't feel like it should! After a water problem and the edge of the carpet had to be pulled back we discovered that the pad was so bad that it just tore so easily, also the don't lay the pad all the way to the edge we discovered that in some places it was a few feet or more from the edge. BAD QUALITY CARPET AND HORRIBLE CUTOMERS SERVICE!!!! OUR CARPET WAS JUST OVER 1 YEAR OLD THEY WOULD DO NOTHING!!!! BEWARE OF EMPIRE CARPETS!!!!! Review #150958 is a subjective opinion of mettec.